Whether you’re talking plans with your contractor or colours with your designer, building a custom home involves hundreds of decisions. The process can be exciting, but also somewhat stressful. How do you know whether you’re making a sound choice that will look good today as well as years down the line? Read on to learn more about some trending concepts you can rely on to create an elegant look for both today and tomorrow. While neutral cabinet finishes like white and grey continue to be a mainstay of kitchens, colourful cabinets are finally making a splash. Go bold with blue or green cabinetry in your kitchen! There are two ways to incorporate this trend into your design. Pair neutral upper cabinets with a darker colour for your base cabinets. A calming slate blue is a popular choice – the colour on the bottom helps ground the design while allowing your kitchen to feel light and airy. 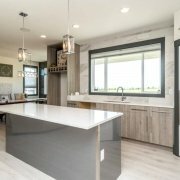 Pair neutral cabinets with coloured cabinets on the island. Go a little more bold with your choice here – because you’re limiting the colour to one section of your kitchen, you can afford to make a splash. These aren’t the only ways to incorporate trendy blues and greens into your kitchen. As you can see in the photo below, the primary cabinet colour is blue and the island is neutral, with stunning results. Gone are the days of metal being an industrial, emotionless and bland choice. Today, top designers encourage home owners to mix metal accents, particular throughout the kitchen. This goes beyond the pulls on your cupboards and drawers – for example, matte black stainless steel appliances are becoming popular in larger centers and will make their way to Prince George eventually. Choose one type of metal to be your main finish. Brass and gold are popular right now, with the options available being less garish than in the past. Choose up to two additional metals to be your accent. Think about more than just the type of metal – try mixing matte and polished finishes. Think about all the metal elements in your kitchen: appliances, range hoods, lighting, faucets, door pulls, and more. Research examples of this trend online and find a way to incorporate into your dream design. 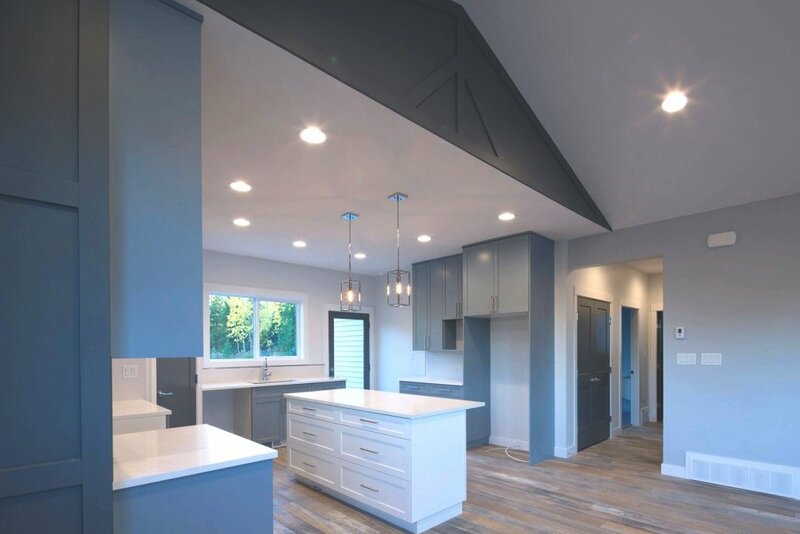 Whether your home is one of a family environment or the dedicated party house, open concept floor plans make a lot of sense for a majority of homeowners. Having the flexibility to keep an eye on the kids while cooking dinner or enjoy the party without having to skimp on the guest list are appealing lifestyle options. Open concept plans are versatile in the sense that they make sense for large houses and smaller ones alike. Choose a plan where the kitchen flows into the dining area, or go all the way and look for a plan that completely opens all the main living spaces. Interested in the concept but having some hesitation? Talk to your home builder about making a statement fireplace area. This offers a way to separate your dining area from a living space while still keeping an open concept. As a bonus, open concepts have a higher resell value down the line.